Luxembourg is the second smallest country in the European Union, but has a remarkable number of campsites. This isn’t surprising when you think of the beautiful countryside and classic towns. 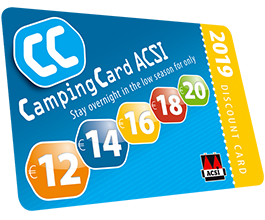 It means you will have plenty of options if you decide to travel to Luxembourg with your CampingCard ACSI in low season. 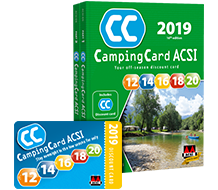 All CampingCard ACSI campsites have one thing in common: you can camp there for bargain prices. ● Luxembourg has a wonderful countryside, perfect for long walks or cycling trips. The eastern region Mullerthal, also known as Little Switzerland, is especially good for walking. The countryside has many different features; the scenery is made up of woods, rocks, and pretty little waterfalls. The area is very popular with tourists, and in high season it is quite crowded. In low season you can really enjoy the quiet of the forests and the little streams. ● In Little Switzerland you will find Echternach, the oldest town in Luxembourg. Echternach was founded in 698 and is still surrounded by its medieval city walls. Despite being bombed during the Second World War, there are plenty of remnants to be found of its past from before the war. Echternach is a town with a long and turbulent history. ● The capital of Luxembourg, also called Luxembourg, has a special atmosphere. This is because there is a small canyon which runs through the centre of town with trees and plants at its base. The canyon also houses casemates, an underground military line of defence from the 17th century. The casemates were used as housing for thousands of soldiers and horses. There were also weapon-makers, kitchens, bakeries and butchers. During the Second World War they served as air-raid shelters. An alleyway full of history. You can view the kilometre long defence works from inside. Luxembourg upholds the good reputation of Northern European campsites: Luxembourg campsites are neat and excellently maintained, and the staff is friendly and helpful. And the biggest plus: they are located in the beautiful countryside. If you visit a Luxembourg campsite, you will always find lakes, forests or mountains at your doorstep. And when you go camping with CampingCard ACSI in low season, you can enjoy all this for a bargain price. Luxembourg is the only country in the world where the monarch is a grand duke. In principle the duke has executive and legislative authority, but in practice his power is limited: the current grand duke Henri only has a representative function. Until 1890 the ‘Grand Duchy of Luxembourg’ was connected to the Netherlands. After Napoleon was beaten in 1815, the Dutch king William I was named grand duke of Luxembourg. Luxembourg remained in the hands of the Orange-Nassau family for three generations. This ended when King William III died in 1980. Luxembourg is not known for its high temperatures and sunny weather, but it can be very pleasant from April. April and May are the sunniest months when discounting the high season, so if you are visiting Luxembourg in the low season, you may be able to catch some sun. Do not expect any Mediterranean temperatures, but those aren’t necessary for a long, vigorous hiking or cycling tour, or for exploring an underground casemate.